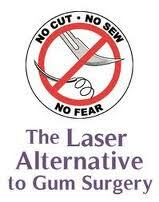 That is the common sentiment of most patients who have received gum surgery done in the traditional way. The cutting of the gums with a scalpel, removal of the infected tissue, and then suturing the mouth to help the gums heal, has been the traditional way to treat gum disease, or periodontal disease over the years. This type of surgery, though very neccessary, instead of losing your teeth, has been the standard protocol for years. Well, that’s how things have been until the LANAP surgery- or Laser Assisted New Attachment Procedure. You see, periodontal disease is what has been affecting millions of American adults for many years. In the past, we thought that after you get to a certain age, you will just be a candidate for dentures or partial dentures. 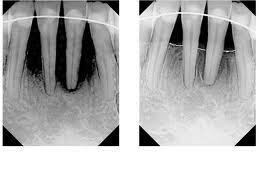 We thought that gum disease was an inevitable condition as a part of aging. However, intensive research has been performed over the years, and we have found that if you are able to keep the plaque off of your teeth successfully, and you can pay attention to your diet, then you are expected to keep your teeth for a lifetime. Additionally much research has been done about the relationship between heart disease, lung disease, many other degenerative diseases and periodontal disease. What we know now is quite stunning. The area of your body with the most bacteria is your mouth. A periodontally compromised mouth will allow the bacteria to travel from the oral cavity to other parts of your and wreak havoc on your other organs. In the healthcare field, we are now fully realizing the impact of poor oral health on your total body health, and therefore, we have to treat periodontal disease, not just to save the teeth, but also, to keep the rest of the body healthy. Well, enter LANAP. The LANAP protocol is a surgical therapy designed for the treatment of periodontal disease through regeneration rather than resection (cutting tissue away). This therapy was developed in 1991 by Dr. Robert Gregg and Dr. Delwin McCarthy to achieve consistently effective and predictable outcomes. The U.S. Food and Drug Administration cleared the LANAP protocol for the treatment of periodontitis, or gum disease, in 2004. No cut, no sew, no fear! The mantra of LANAP. We do not use the scalpel, we do not need to suture the gums back together, and patients say it is like night and day, compared with the old traditional way of periodontal surgery. If you or a loved one, has bleeding gums, bad odor in their mouth (bad breath), red or inflamed gums, or know you have a history of periodontal disease; find a dentist who performs the LANAP surgery, you can save your teeth. Your teeth should last you for a lifetime!